Pioneering environment journalist and mentor to many of India’s journalists, Darryl D’monte, died in Mumbai on March 16. Darryl was among the first to look at environment from the critical perspective of journalism. Mongabay-India’s senior contributing editor, S. Gopikrishna Warrier pays tribute to the leading light of environment journalism in India, who left a professional and personal impact on him and many other journalists in the region. Darryl D’Monte, India’s pioneering environment journalist and editor died in Mumbai on March 16. He was 75. Earlier in his career, he was resident editor of the Indian Express and Times of India in Mumbai. He also headed professional environment journalism bodies as the chairman emeritus of the Forum of Environmental Journalists in India and the former president of the International Federation of Environmental Journalists. Darryl continued to be a practising environment journalist till his last months, and also wrote stories for Mongabay-India. Darryl D’Monte. Photo by Neeraj Khera. In the mid 1980s, when I was studying biology, literature and journalism and aspiring to become an environment journalist, there was no genre as today called environment journalism in India. Darryl carried the torch, clearing the pathway for environment journalism through the undergrowth of all kinds of general reporting. I started my career reading Darryl’s writings. He was not an activist, neither was he a diehard conservationist, but he looked at environment from the critical perspective of journalism. In 1985, Darryl wrote about three environmental controversies in a book published by the Centre for Science and Environment, called Temples or tombs? Industry versus environment: three controversies. One of the three controversies that he covered in his book was about the Silent Valley hydroelectric project in the late 1970s-1980s. Darryl’s writing was my primary reference material when I was researching on the milestone controversy for my story in Mongabay-India. However, Darryl’s professional and personal impact on many environment journalists like me in the country was beyond his writing. He mentored and guided us and ensured we had opportunities to participate in training workshops and meetings to improve our understanding and skills. In the 1990s, when the economic reforms had just been launched and the media houses were singing hosannas for economic development, there were very few professional training opportunities for those wanting to report on the environment. In 1997, Darryl helped the World Bank to organise a workshop for three levels of participants from the six South Asian countries – Bangladesh, Bhutan, India, Nepal, Pakistan and Sri Lanka – at Goa. The workshop brought together parliamentarians, senior officials and journalists. It was during that workshop I realised the animosity that our neighbouring countries have towards India. While during the mornings the delegates from other countries criticised India’s neighbourhood policies, in the evenings we gathered together to sing songs from Bollywood movies. I was introduced to the feint and parry of the subcontinental politics. One session that Darryl had organised was a discussion with Justice P.B. Sawant, a retired Supreme Court judge, who was then the chairman of the Press Council of India. Sawant spoke and answered questions on how the media can stay away from getting involved in contempt of court issues while covering environmental cases. Two decades later, I still use those lessons in day-to-day journalism. Darryl not only mentored us to become good environment journalists in India but also cover environment from an international perspective. 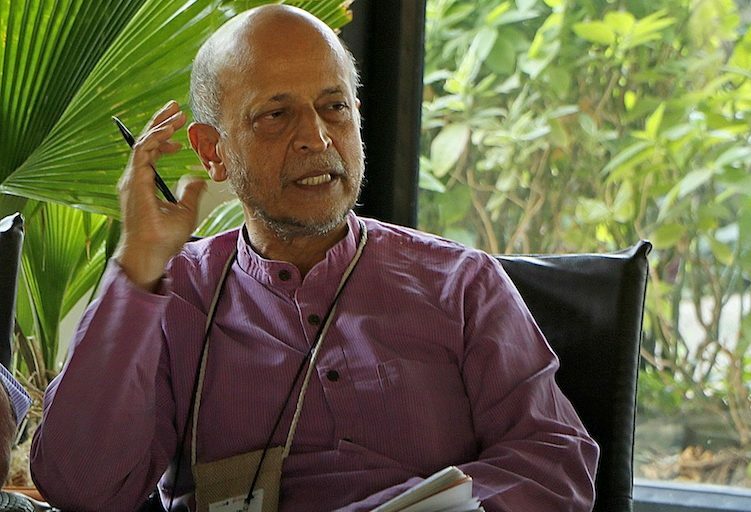 In 1998, he organised a meeting of FEJI at Mumbai in collaboration with the Goethe Institut, where Indian and international environment journalists exchanged notes about the climate change negotiations. Water and sanitation was another topic he was interested in, and I was involved with him in organising two media workshops on it in 2002 and 2003. The first one was organised in Chennai at the M.S. Swaminathan Research Foundation (MSSRF). The second one was organised at the International Crops Research Institute for the Semi-Arid Tropics (ICRISAT), at Hyderabad. I had by then joined ICRISAT to handle media relations for the institute. Darryl had collaborated with the World Bank and the Water Supply and Sanitation Collaborative Council (WSSCC) to organise these workshops. In addition to getting the best global experts for these workshops, Darryl also invited the up and coming environment journalists from across South Asia. 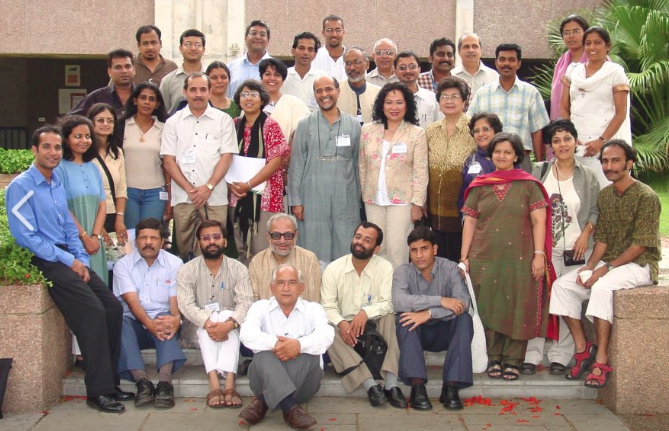 Darryl D’Monte (centre) with experts and journalists at the water media workshop held at ICRISAT in 2003. Photo by Shiv Kumar. In more recent years, Darryl and I worked together in a team to develop a training curriculum for journalists and journalism students on coastal and marine biodiversity conservation. This project, developed by the German technical organisation GIZ for the Ministry of Environment, Forest and Climate Change (MoEFCC), went through multiple phases and meetings. At one stage, after we had developed the curriculum for journalism students, we pilot-tested it with the students of Xavier Institute of Communications at Mumbai. Darryl mingled joyfully and energetically with the students in their group exercises and field trips. As a good journalist he opted to remain a perpetual student. 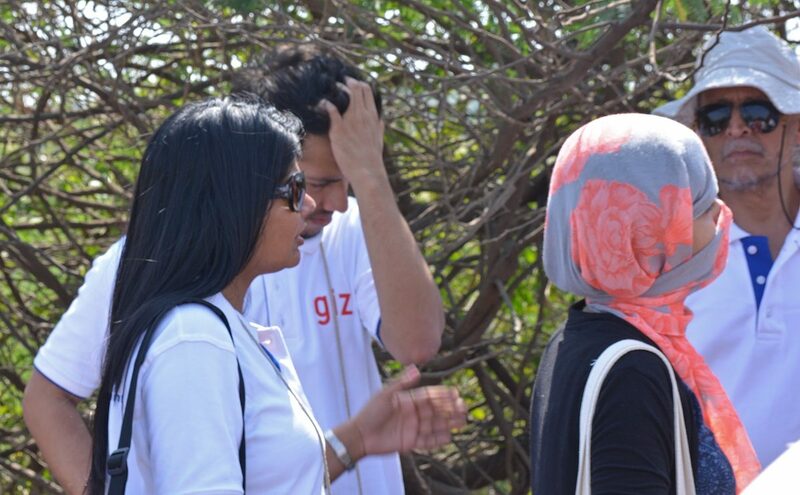 Darryl during a field trip related to the coastal biodiversity project. Photo by S. Gopikrishna Warrier/Mongabay. On Sunday, as the news of Darryl’s death spread through email and social media networks, there were many journalists who wrote about their interactions with him. The stories were different, and so were the contexts. However, the common thread was of his concern to find the best opportunities for anybody interested in environment journalism, and encourage and support them to pursue the leads. There was unanimous praise about his gentleness. Recently, I met a senior editor who had worked in Times of India when Darryl was the boss. The editor said that even in the high-strung newsroom environment of a day-to-day publication, Darryl was always civil and cordial in his professional relationships. Even though Darryl was mild mannered and avoided the nastiness that journalists and editors are famous for in their working relationships, he was not liberal with praise. Once, while working on the coastal biodiversity project, I had drafted a chapter in the curriculum and Darryl liked it. “Very good, have a drink on me this evening,” he messaged me. I was surprised at his appreciation. Banner image: The Carter Road promenade and the mangroves in Bandra, Mumbai. Darryl was active in local citizens’ activities to conserve the Bandra shoreline. Photo by Manish Makhija.